Popular and Longest Running Show of Star Plus Yeh Rishta Kya Kehlata Hai is Getting Interested Day By Day After Leap and Professor-Student Tashan Between Kartik (Mohsin Khan)-Naira (Shivangi Joshi). Now In upcoming Episode, We will witness some major twist and turns. One Side Where Naira took Kartik her apartment in his Drunk State and Also Got Shocked to Listen About His Drinking Habit and They have Moment In her Apartment They Slept In Each Other’s Arms. 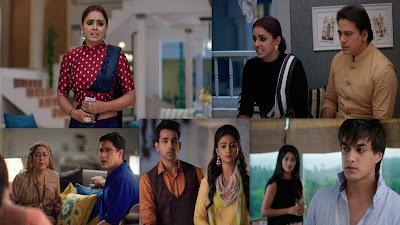 On the Other Side We have Seen In Latest Episode that Bhabhi Maa Overheard Suwarna’s Plan of Kartik’s Remarriage But Devyani Changed the Topic By Saying That You didn’t wear Your earning Machine. There Naitik (Vishal Singh) is Back in Jaipur at Singhania House Because His Son Naksh (Rishi Dev) needs him. Keerti Requested Him to Come Back for Naksh and He Couldn’t Refuse to her Request. Shockingly during a family meeting, Bhabhi ma will alert the family that she heard Swarna (Parul Chauhan) discussing Kartik’s second marriage plan. Naitik, as well as the rest of the family, will be shocked to know about Swarna’s shockingly move.